Pain in the waist and lower extremities is often caused by invasion of wind-coldness and wind-dampness into the channels and collaterals due to sitting or lying on damp ground. Internal injury caused by overstrains, deficiency, weakness of kidney Qi, insufficiency of vital essence, and trauma are also causes of this disorder. It is a syndrome similar to the symptoms of protrusion of intervertebral disc, sciatica and others. Symptoms. Those with pain in the waist and lower extremities of the wind-cold-damp type, often have the following symptoms: soreness of the waist, difficulty in waist movement, radiation of pain to the legs or feet in severe cases, aggravation of pain in cloudy weather, and local sensation of coldness. Those, with pain in the waist due to kidney deficiency have symptoms of protracted and dull pain, lassitude in the loins and legs, listlessness, and a rapid, fine pulse. Patients with pain in the waist and lower extremities due to trauma, usually have the symptoms of marked tenderness, mild swelling, and radiating pain along the Gallbladder Channel of Foot-Shaoyang or the Urinary Bladder Channel of Foot Taiyang. 1. 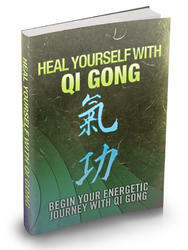 Self-Treatment with Qigong Exercise. Practice Waist Exercise and Exercise of the Lower Extremities. 2. Treatment with Out going Qi. Press and knead the points Shenshu (U.B. 23), Mingmen (Du 4), Yaoyangguan (Du 3), Huantiao (G.B. 30), Yanglingquan (G.B. 34), Weizhong (U.B. 40), Chengshan (U.B. 57), Kunlun (U.B. 60), and Taixi (K 3) to dredge the Channels and promote the channel Qi to flow. 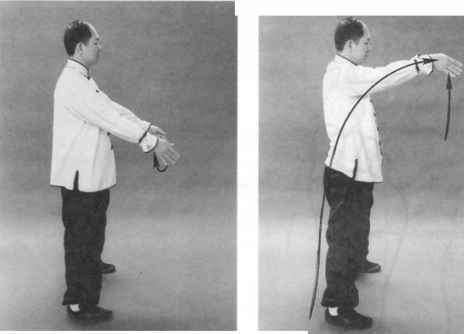 Emit Qi, with Flat Palm gesture and pushing-pulling-leading manipulation toward the points Mingmen (Du 4) and Shenshu (U.B. 23), and guide Qi downward along the Urinary Bladder Channel of Foot Tatyang. Using Flat Palm gesture and pushing-pulling-leading manipulations, emit Qi towards Huantiao (G.B. 30), and guide Qi to flow towards the lower-extremities along the Gall Bladder Channel of Voot-Shaoyang to help dredge the channel. Carry out oblique pulling of the waist, palm-patting, and passive movements of waist, hips, and knees to relieve rigidity of the joints, relax muscles and tendons, and promote blood circulation.